Public land domestic sheep grazers and bighorn advocates have been clashing for decades over land-use conflicts which place bighorn sheep populations at risk of deadly disease. With the passage of the Consolidated Appropriations Act of 2012, favorable policy change promises new avenues of conflict resolution that may leave both sides with something to be happy about. Bighorn advocates including Western Watersheds Project, the Hells Canyon Preservation Council, The Wilderness Society and allies have been successful in applying judicial pressure to the Forest Service. A series of successful lawsuits have compelled land managers to acknowledge best science and manage land-uses to restrict the risk domestic sheep grazing poses to bighorn sheep viability in areas where domestic sheep grazing overlaps bighorn habitat on public land. In mid-2010, after several court victories prompted by the excellent legal counsel of Laurie Rule – Advocates for the West, the Payette National Forest had little choice but to implement management restrictions protective of bighorn sheep by significantly reducing domestic sheep grazing on the Forest by over 70%. All eyes were on the Payette. Land managers on Forest Service and Bureau of Land Management lands across the West had been holding out against meaningful reductions of domestic sheep grazing on their own Forests and Districts. The hold-outs fall into two general camps: Those maintaining solidarity with the sheep industry and those timidly waiting in anticipation of gaining the legal and scientific cover of the finalized Payette Bighorn Sheep Viability Forest Plan Amendment (Payette Decision), a process backed by years of best-science, hashed-out legal wranglings, and court-ordered environmental review. The Payette Decision sent shock-waves across public land and wildlife management agencies throughout the West. It’s reach terrifies Woolgrowers who, despite having history of falling flat on their face when attempting to muddy-the-waters on the unequivocal science demonstrating disease transmission from domestic sheep to bighorns, have been none-the-less accustomed to agency capitulation in response to their local and state political muscle. The scope of the science and lawfully administered mandate to ensure ‘species viability’ (a standard set by the 1982 implemented regulations for the National Forest Management Act) is a true game-changer for bighorn sheep across the West. Even so, what the domestic sheep industry lacks in scientific competency it makes up for with political prowess. SEC. 442. None of the funds made available by this Act or any other Act through fiscal year 2016 may be used to plan or carry out any action or any subsequent agency regulation for managing bighorn sheep (whether native or nonnative) populations on any parcel of Federal land (as defined in section 3 of the Healthy Forests Restoration Act of 2003 (16 U.S.C. 6502)) if the action may or will result in a reduction in the number of domestic livestock permitted to graze on the parcel or in the distribution of livestock on the parcel. Representative Simpson’s legislation would have halted any federal dollars from being spent to implement the Payette Decision, or any other decision that would restrict domestic sheep grazing to protect bighorns, for five years. Seizing the national political stage, Woolgrowers continued their persistent campaign pushing to obfuscate the issue by spreading an industry letter (pdf) and talking points (pdf) around the Committee on Appropriations in the U.S. House of Representatives, with misinformation in the press and eventually in testimony at a hearing on the issue held by the House Subcommittee on National Parks, Forests and Public Lands. 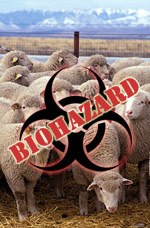 The Woolgrowers plead for the 5-year “time-out” to develop a vaccine researchers maintain wouldn’t be ready for at least 10-15 years, if it ends up being viable at all. By mid-July Beltway bighorn advocates began stirring in response to the Woolgrowers’ letters and Simpson’s language. Ideas about efforts to respond began to culminate. National groups including the Natural Resource Defense Council and the Wild Sheep Foundation (formerly Foundation for North American Wild Sheep) began calling in appointments to discuss the bill with congressional staffers. Having just come off an encouraging trip to D.C. promoting comprehensive, voluntary public land grazing buy-out legislation as a possible win-win solution to natural resource conflicts in the U.S. House of Representatives, several public land and wildlife activists resolved to revisit in December to build support for the Rural Economic Vitalization Act (H.R. 3432) and address many of the bad grazing riders that were making their way into the budget process, including the Bighorn Rider. On December 11 Mike Hudak of the Sierra Club Grazing Team, Josh Osher of the Buffalo Field Campaign, and myself (WWP) convened on Washington D.C. and cruised the legislative environs in the comfort of an early 1980s Oldsmobile. After a few days, the scuttlebutt on the Hill was encouraging. It was obvious that the Bighorn Rider was being talked about and that it was a concern among conservation and sportsmen sympathetic members of Congress, including those in influential positions in relevant committees. However, with heightening pressure culminating on the budget, it was unclear which riders would make the final cut, which would be negotiated away, and what the final language would be. (2) any other agency regulation for managing bighorn sheep populations on any allotment of such National Forest System land if the management action will result in a reduction in the number of domestic livestock permitted to graze on the allotment or in the distribution of livestock on the allotment. (c) Bureau of Land Management Lands- In circumstances involving conflicts between bighorn sheep and domestic sheep grazing on public lands (as defined in section 103 of the Federal Land Policy and Management Act of 1976 (43 U.S.C. 1702)), the Bureau of Land Management may only modify or cancel domestic sheep grazing permits after consulting with the appropriate State fish and game agency. However, if the State in question has an approved State Wildlife Management Plan that addresses, with specificity, bighorn sheep management, then the Bureau of Land Management modification or cancellation of permits in that State shall conform to the bighorn sheep management objectives in the State Wildlife Management Plan, unless conformance would be inconsistent with Federal statute or regulation. The Bureau of Land Management shall be bound by the requirements of this subsection until September 30, 2012. (d) Voluntary Closure of Allotments- Nothing in this section shall be construed as limiting the voluntary closure of existing domestic sheep allotments when the closure is agreed to in writing between the permittee and the Secretary of the Interior or the Secretary of Agriculture and is carried out for the purpose of reducing conflicts between domestic sheep and bighorn sheep. (3) provide for the reimbursement of range improvements in compliance with section 4 of the Act of June 28, 1934 (commonly known as the Taylor Grazing Act; 43 U.S.C. 315c). The language signed into law is significantly less troublesome for bighorn sheep than that first introduced by Representative Simpson. The duration of the restriction on use of federally appropriated funds to carry out management restrictions is limited to Fiscal Year 2012, as opposed to the 5-year duration previously considered. No doubt Woolgrowers and Simpson will seek to extend the restriction in following years. Simpson’s original language precluded use of budget dollars to “plan or carry out” any reductions or restrictions on domestic sheep grazing. The passed language omits the word “plan” indicating that the use of federally appropriated dollars to conduct environmental review remains available, which is likely the most recourse bighorn advocates might prompt – at least initially – as the result of any lawsuit elsewhere in the meantime. Restrictions are further limited to any management changes “in excess of the management restrictions that existed on July 1, 2011 “. The Payette Decision was finalized on July 30, 2010. It is unclear whether the Payette National Forest will interpret the language of the bill to halt implementation of Phase 3 of the Payette Decision, or whether it will carry out its finalized decision as per its July 30, 2010 decision made prior to the rider’s cutoff date. No doubt Woolgrowers will be arguing that “excess” includes abstention from implementation of Phase 3 of the Payette Decision, the final phase reducing domestic sheep grazing by over 70% on the forest. Bighorn advocates have compelling ground on which to challenge any such agency interpretation favorable to Woolgrowers. The real victory for bighorn sheep throughout the West comes with the inclusion of statutory direction to permanently retire domestic sheep grazing on allotments that are in conflict with bighorn sheep, Sec. 431 (d) & (e), when those permits are waived to the administering agency by the permittee. This provision comes with no time limitation and appears to apply West-wide. The inclusion of language providing for voluntary buy-out of conflicting allotments opens up an important alternative to adversarial litigation enabling a new opportunity for bighorn advocates and domestic sheep interests to resolve their conflicts collaboratively and in such a way that both interests ‘win’. Domestic sheep ranchers looking down the barrel of the Forest Service or BLM’s legal obligation to protect bighorn sheep have an opportunity to recapitalize their operations, pay off any outstanding debt, pursue a hansom retirement, or otherwise cash-out on their federal grazing lease now have the option, if they so choose. Bighorn sheep advocates have the opportunity to put their resources into permanent solutions that keep bighorn sheep on disease-free habitats without fear of political back-lash. It remains to be seen how the Payette National Forest interprets the language of this long anticipated legislative action. It is true – the buyout provisions only permanently retire allotments from domestic sheep use. However, should those allotments retire – agency would be required to conduct environmental review to re-open those allotments to cattle or other livestock, which includes public opportunity at oversight and challenge. The encouraging thing about this (as well as the California Desert Conservation Area – an area of over 25 million acres now subject to permanent retirement/buy-out with passage of the Consolidated Appropriations bill) is that it demonstrates the emboldening willingness of policy-makers and legislators to adopt the buy-out mechanism as a politically pragmatic option in resolving natural resource conflicts with public lands ranching. The same may one day prove beneficial to wolves, fish, sage-grouse and other wildlife – or in legislative responses to catastrophic wildfires – etc. etc. etc. Hopefully, public land managers will read this article and the links again and again. This applies nationally, not just to Idaho, just as Simpson’s original rider applied to all of the country, not just the handful of sheep barons on Idaho. Good work pushing back. The science is very clear. The opposition is again obfuscating, misrepresenting and outright lying. Fascinating that one of the more prominent scientists” backing the woolgrowers is up for a major Federal appropriation to his lab to develop the much ballyhood vaccine (conflict of interest ?) …..one that has little practical use in bighorn, but might help keep sheep generally healthier….maybe that’s just another subsidy for the industry in wildlife clothing…. Before the west is entirely converted to the only thing hooved locusts don’t destroy-wyethia- maybe here and there a parcel might be saved for nature to live in! Would anyone like to take a guess at why federal and state agencies are more interested in Bighorn conservation projects than sheep farming? They realize there is a massive amount of hunter’s dollars to be tapped from sheep hunters. Much more than exists for domestic sheep. This year they have allready sold a single sheep tag for the state of Montana for $300,000. Good thing hunters bring value to wildlife and save it for future generations. Thanks, but the thing of it is, that for some states like Idaho, the much greater value of bighorn sheep compared to domestic sheep, where they are in competition, is that state officials don’t care about the money. In Idaho the current political oligarchy honors a handful of big sheep growers and cattle growers and they have appointed a Fish and Game Commission that doesn’t care for any wildlife or game that competes with any kind of traditional livestock.